Submitter Brandon and a large group of wannabe dino-killers on Thrall (US) got tired of waiting for Galleon to spawn, so they decided to speed it up with the eldritch magic of a proto-drake circle. Galleon did indeed appear shortly thereafter, but after seeing the mass of dragons arrayed against him, he hearthed back to wherever he came from and called Oondasta to come to the scene for some backup. And then everyone died. Around Azeroth: Hey, come out and play originally appeared on WoW Insider on Sat, 23 Mar 2013 10:00:00 EST. Please see our terms for use of feeds. There are lots of reasons to join a guild: it makes it easy to find groups and raids, you have guaranteed company while you're playing, and most importantly, guild perks. In case you've been living under a rock, guild perks give you great bonuses for guild membership based on your guild's level. Perks can boost the amount of experience, reputation, and honor you gain, make your hearthstone cooldown shorter, and even make flight paths go faster. So, really, the question seems to be why not join a guild? The question's been asked on Reddit and it got me wondering why my own alt of choice (for the moment) is currently unguilded. It couldn't take much more than a polite request to jump on the guild bandwagon and get my hands on those yummy, yummy perks. It would stop the regular requests I get to join guilds (even if you've turned off guild requests, you do frequently get whispers) and it's not as though I'm in a demanding guild at the moment. And yet when I don't feel like doing much (or dealing with others), I hop on to my alt to solo for a while. And what about you, fellow players? Are you guilded or unguilded? Breakfast Topic: Why join a guild? originally appeared on WoW Insider on Sat, 23 Mar 2013 08:00:00 EST. Please see our terms for use of feeds. Hot off the presses tonight is the patch 5.3 PTR Patch Notes. Right off the bat to quell any rumors -- there is no indication of when the PTR will be active (other than soon), or when this patch is going to drop. Battle of the High Seas, Blood in the Snow, Dark Heart of Pandaria, The Secrets of Emberdeep -- four, yes not one, not two, not three, but four new scenarios. Bonus rolls have a progressively better chance at awarding loot if you've used them and they turn up nothing. We can now pick a loot specalization that's different than our current spec for LFR, Bonus Rolls, and Pandarian quests. World of Warcraft Patch 5.3 PTR Patch Notes originally appeared on WoW Insider on Fri, 22 Mar 2013 21:29:00 EST. Please see our terms for use of feeds. The worgen ran on all fours. Thick padded feet pounded earth and stone and grass. He occasionally swapped out the canine gift of his nation for the more magnificent speed of a stag. But mostly, the worgen just ran. The Band of Finding glittered on his paw. Hand. Hoof. It's a druid, it changes, okay? While the ring would hardly be the biggest upgrade the druid would see in Pandaria's misty realm, he liked the synchronicity of it. The druid was trying to find his band, so why not use the Band of Finding? So still, he just kept running. After so long a separation, the druid was pretty sure he'd beat up the blood elf and orc as soon as he found them. It seemed appropriate, at this point. Item Note: You pick up the Band of Finding from Finding Your Center or Instant Messaging. You get it fairly early into the late 80s, so it's not like it's a mind-blowing ring long term. But if you're gearing up a Strength DPS character, make sure to tuck it away in your pocket. I found myself using it for a surprisingly long time. Phat Loot Phriday: Band of Finding originally appeared on WoW Insider on Fri, 22 Mar 2013 20:00:00 EST. Please see our terms for use of feeds. I didn't see this until recently, but I'm really glad I did. Andy Gavin, the co-creator of Crash Bandicoot and Jak & Daxter, ran a series between the end of November and mid-January examining WoW, its four expansions, and how each of them succeeded or failed through both personal and professional eyes. His particular focus is the endgame in each and how it worked to attract and retain players -- or, in some cases, didn't. While there's certainly been no shortage of player commentary on how WoW's developed, Gavin's experience as a game developer who's not involved with Blizzard is a pretty unique perspective. I found his article on Cataclysm to be particularly adept at putting into words a lot of things I felt but had difficulty articulating. Most of the expansion's developmental time had to go into a revamped leveling process that few people saw unless they wanted to level a new alt. The content at 85 that greeted more casual players got bottlenecked in a series of difficult heroics that frustrated players dropped constantly. Personally, I still consider Cataclysm to have been a necessary expansion -- it did a lot of stuff that Blizzard had to do for the game even if it wasn't as eye-catching as what BC and Wrath did -- but I think Gavin's assessment is accurate and measured. (And many of Blizzard's own observations aren't all that different.) Funnily enough, with lots of people leveling new monks in Mists of Pandaria, more people might be seeing Cataclysm content now than they did during the expansion that was actually dedicated to it. "Crash Bandicoot" creator comments on Cataclysm's problems and the evolution of WoW originally appeared on WoW Insider on Fri, 22 Mar 2013 19:00:00 EST. Please see our terms for use of feeds. It's been a little while since we've heard from Croftzi, so when I got a mail from her, I was pretty excited. This is a fairly straightforward video, but I can't tell you anything about it. You have to experience it. However, it Croftzi's word, she tried to make it "a very dramatic story." So kick back and take a couple minutes to watch The Search for Hope. WoW Moviewatch: The Search for Hope originally appeared on WoW Insider on Fri, 22 Mar 2013 18:00:00 EST. Please see our terms for use of feeds. I'm going to open this one with a personal story. In 2009 at a Blizzcon party, I had the good fortune to be introduced to Russell Brower, and I promptly went all starry-eyed and gushed about how much I loved WoW's music. His face lit up and he said, "Oh you are just the best thing!" and kissed my hand. Then asked me what my favorite was. My answer was immediate, and without hesitation: Black Temple. Now, let's fast-forward to today, in 2013, almost four years later. Has my answer changed? Maybe. Black Temple is still definitely up there, but I'm not sure it's the out-and-away winner anymore. With Cataclysm many of the zones got updated music, so areas I wasn't super enthused about before suddenly became much more compelling. In the end, the five I've come up with are Grizzly Hills (a perennial favorite), Black Temple (still love it), Ashenvale ("Nightsong" alone makes this nomination), Karazhan (haunted mansion! ), and Kun-Lai Summit (mostly for "Way of the Monk," which plays upon entry into the Temple of the White Tiger). Vote on your favorite in the poll, but don't think this is the definitive list. I'm sure there are plenty of zones I've overlooked, so tell us what I've missed in the comments. Poll: What zone has the best music? originally appeared on WoW Insider on Fri, 22 Mar 2013 17:00:00 EST. Please see our terms for use of feeds. The deadly dinosaur that caused the mass destruction you see documented in this picture, which was tweeted recently by Dave Kosak, has had a massive nerf to his health. It's gone from 872 million to 436 million, which is a 50% nerf. The reason for this is likely twofold. Firstly, the boss was very hard to kill, and players were not unfairly deciding that the cost in repairs and time of killing Oondasta was too much compared to the gear drop chance and the quality of the gear. With patch 5.2 there are easier ways to get gear than killing this boss. Secondly, the huge numbers "required" to kill this boss meant that servers were struggling under the load of hundreds of people taking on this boss. One viable "tactic" was to get so many people attacking Oondasta that the server lagged out so badly that he was only using a few of his abilities with long intervals in between. Rygarius said a while back that while Oondasta was great, in that he brought back the epic outdoor raid feel, but that the big groups were causing server stability problems, so this is likely another step in trying to fix that issue. It seems like the nerf, meaning that the graveyard zerg tactic would likely not need 200 people to succeed, will make players happy to pull with smaller groups. This will help with the server stability, but is it a worthwhile exchange? Hit the break for Lead Encounter Designer Ion Hazzikostas' input on the change. Oondasta's health pool nerfed by 50% originally appeared on WoW Insider on Fri, 22 Mar 2013 16:00:00 EST. Please see our terms for use of feeds. Well, if you haven't been watching the blog today, you might not have heard: Hearthstone has been announced. An online, free-to-play digital card game, Hearthstone might start a whole new wave of WoW madness. TradeChat explains the game, shares the preview, and basically tells us what's up. Find out what we know so far about the new game! TradeChat rounds up Hearthstone: Heroes of Warcraft originally appeared on WoW Insider on Fri, 22 Mar 2013 15:00:00 EST. Please see our terms for use of feeds. What aspect of WoW has given you the most devilish time? Maybe it's something that you've finally come to grips with after many arduous hours, like PvP. Or maybe it's something that's made you throw your hands up in exasperation, resolving to avoid it forevermore, like PvP. Let's face it: PvP certainly has quite a rep for intimidating and exasperating players. Not me, though. I'm totally down with PvP. The thing that throws me for a loop is the whole economy and Auction House thing. Despite editing Gold Capped after Gold Capped article during my time in the WoW Insider editorial chair, I've never managed to wrap my brain around strategizing how to make money in game. I use an AH addon strictly to help me get the heck outta Dodge. I want that stuff gone! Since much earlier eras, I've never been short on funds for anything I really wanted to buy, so my slapdash approach seems to serve me adequately. As a result, the inner workings of my AH addon and the realm economy in general remain all rather mysterious to me. I simply can't (and won't) take time to digest all that twitchy detail. I have a friend, though, for whom playing the market is an amuse-bouche to any good play session. Unfortunately, his idea of a good play session and mine diverge at the point that it's time for him to move out of the fire -- his painfully evident Achilles heel. I have no idea how he hasn't internalized this basic by now, but there it is. He's just not a mover. I heal him a lot. We love him anyway. What part of WoW's gameplay bedevils you to this day? Maybe it's something that took you more time than you'd have liked to master. Perhaps you're still struggling. Or maybe it's something that you've just never figured out (and possibly never want to). What's your WoW Achilles heel? Lunch Topic: What's your WoW Achilles heel? originally appeared on WoW Insider on Fri, 22 Mar 2013 14:00:00 EST. Please see our terms for use of feeds. Blizzard posted a blog today on the much-discussed return of the item upgrades to the game in patch 5.3. Lead Systems Designer Greg "Ghostcrawler" Street had commented in recent interviews that the system would be very unlikely to return for PvP, so there's no great surprise in that statement. There will still be upgrades available in patch 5.3 for season 12 gear, which was always upgradeable, at its original cost, so 750 Conquest for four item levels, useable twice. As the blog states, "no other PvP items are upgradable, and no new PvP items for the foreseeable future will use the upgrade system." This is a good thing. There are already potential issues emerging thanks to the item levels of the new gear, where the gaps in between the lower tiers and the upper tiers look to be too great, and adding item upgrades into the mix would only cause more problems. For PvE, as expected, the item upgrade system will be reappearing in patch 5.3. However, some changes have been made that iron out some issues the Blizzard team was unhappy with. Patch 5.3: Item upgrades to return for PvE, not for PvP originally appeared on WoW Insider on Fri, 22 Mar 2013 13:00:00 EST. Please see our terms for use of feeds. Let's get in a cab. I'll buy you a kebab! Do I need to have completed any of the Black Prince quests to loot a sha-touched weapon? I still need to collect one more Sigil of Power to get the gem, but Spiritsever hasn't dropped for me yet after ten rolls. Is my RNG really that bad, or do I need to finish The Strength of One's Foes? Nope, I haven't completed The Strength of One's Foes on my DK and just yesterday got a Shin'ka from the Sha of Fear. You just have rotten luck! The Queue: Part-time model originally appeared on WoW Insider on Fri, 22 Mar 2013 12:00:00 EST. Please see our terms for use of feeds. We're going to keep this post updated throughout the day with all the latest HearthStone information. Here's what we know so far. HearthStone is a new digital collectible card game (CCG) that takes place in the Warcraft universe. HearthStone is free to play. It's set for release this year. The beta will happen this summer. You can sign up for the beta now over at HearthStone's site. It will initially be playable on the Mac and PC. iPad version to follow soon (and not Blizzard soon, but reality soon). PC and iPad version are playable now at PAX East. Blizzard is looking at the possibility of future platforms (in response to the Android comments), but development is focused on PC, Mac, and iPad right now. What we know so far about HearthStone: Heroes of Warcraft originally appeared on WoW Insider on Fri, 22 Mar 2013 10:40:00 EST. Please see our terms for use of feeds. Blizzard has just released the cinematic for HearthStone, embedded above. It's fun and goofy, which is the impression I have of the game itself! The voice-over goes through some of Warcraft's most notable heroes: Thrall, Jaina, Illidan, Garrosh, and settles on some beer-swilling dwarves telling you to forget about blood and honor and just sit back and enjoy yourself. Kind of sounds like a Saturday night in Ironforge, doesn't it? I'm already looking forward to this game more than I would have thought. I'm a sucker for cartoonish fun, which this game looks to have in spades. I've always enjoyed card games like Magic: The Gathering but I hate physically collecting cards, and I've moved so much in the last ten years that I lose them anyway. Digital card games are growing in popularity, and Hearthstone seems like a solid addition to the genre. HearthStone Cinematic originally appeared on WoW Insider on Fri, 22 Mar 2013 10:39:00 EST. Please see our terms for use of feeds. We don't have any idea what it's going to be (besides something new), but Blizzard is going to be announcing it at PAX East today. We'll keep run a live blog of the announcement right here! Expect more throughout the day. Blizzard announces HearthStone at PAX East 2013 live blog originally appeared on WoW Insider on Fri, 22 Mar 2013 09:10:00 EST. Please see our terms for use of feeds. It's been a while since we've featured bad in-game interior design here on Around Azeroth. After the goblin decorating fiascos of Cataclysm, there was really nothing uglier to design, although the Velvet Elvis of Icecrown still holds a special place in my heart. This painting of a scantily clad woman holding a fan is actually not too bad, but submitter Nounours of Spectacular Death on Llane (US-A) doesn't seem too fond of it. Maybe she thinks that the model's lack of body hair promotes unrealistic body image standards for worgen ladies. Real women have top hats! Around Azeroth: Girls with low self-esteem originally appeared on WoW Insider on Fri, 22 Mar 2013 09:00:00 EST. Please see our terms for use of feeds. Just when you thought it was over, another round of hotfixes have been released. Today's list of fixes is pretty short and sweet, with only one small class related bug fix. The rest of the tweaks by and large involve the Isle of Thunder and the Throne of Thunder raid. And for those diligently working on stage 3 daily quests out there on the Isle, one of these changes should be a welcome relief. Statue pieces for the Crumbled Chamberlain now do not despawn when looted, which means the hours of trying to beat other players to those pesky gear icons are officially over. Rejoice! Because everyone loves a laser-slingin' dinosaur, Oondasta now respawns much more frequently. Melee, you can cease fearing the snail. Gastropods in the Throne of Thunder should now favor attackers at range. Patch 5.2 hotfixes for March 21 originally appeared on WoW Insider on Fri, 22 Mar 2013 08:00:00 EST. Please see our terms for use of feeds. Over at the official forums Community Manager Nethaera has a bit of an unusual question for everyone: do you dream of electric sheep? Well, okay, it's not exactly that question. She wants to know what unusual or unique items you hoard, keep, or carry and the reason why. Do you hang onto Pamela Redpath's tea for courage when you face the undead? Do you keep Archmage Vargoth's Staff for some company on those long, Netherstorm nights? Or is it a practical item that you prefer - a repair bot or the Direbrew Remote for when you simply must have some of that Dark Iron brew? This question is actually a tough one for me to answer. Not because I don't have an answer but because I have entirely too many answers. My bags and bank are stuffed full of random items that I refuse to get rid of, even now-useless stuff like Shard of the Fallen Star. I guess if I had to choose, I'd say it'd be a tie for two: my Orb of Deception and Orb of the Sin'dorei. I love turning my night elf into an undead or blood elf, respectively, though unfortunately the Orb of Deception requires being equipped in a trinket slot to work, so it's not very practical for raiding. The Orb of the Sin'dorei you can just click to use. True story: once upon a time back in Wrath I was hanging out, transformed into a blood elf, at the Ulduar summoning stone helping bring my guildmates to the raid. Another Alliance player walked up and /spit on me. When I whispered him with a frowny face emote, he freaked out and thought I was a hacker. Helpful tip, my friend: a blood elf in full tier 7 druid gear is not actually a blood elf! Also, you shouldn't /spit on people, it's really rude! Nethaera wants to know your most coveted and unusual items originally appeared on WoW Insider on Thu, 21 Mar 2013 20:00:00 EST. Please see our terms for use of feeds. Every Thursday, The Overachiever shows you how to work toward those sweet achievement points. This week, we rue the lack of High Poobah among the game's honorifics. An interesting question in the Tanking forum about a month back spurred an article for readers here about which title they find most reassuring on a fellow player. The discussion that ensued was a reminder that you can't get some of the more popular picks anymore, and just why they meant -- and continue to mean -- something in the first place. Sad to say, these titles are no longer accessible, unless you manage to find some far-flung server at the end of the universe where no one's bothered to kill Sartharion at all. The OverAchiever: The game's 13 vanished titles originally appeared on WoW Insider on Thu, 21 Mar 2013 19:00:00 EST. Please see our terms for use of feeds. Work Warning: Characters with no armor appear in this video. Have you ever felt the pain and shame of having your character stolen, stripped naked, and left for dead? At this point in the game's history, many of us have taken that walk of shame to the GM's doorstep to ask for help. This is a pain that Rogahar and Sharm seem to know well. You Stole My Toon features the mournful lament of a character who's lost everything. The video apparently took a very long time to create, with the last scene alone taking 50 hours to render. It's easy to see where the time went: some of the animation is downright impressive. WoW Moviewatch: You Stole My Toon originally appeared on WoW Insider on Thu, 21 Mar 2013 18:00:00 EST. Please see our terms for use of feeds. Let's talk alts, people. How many 90s are you altaholics running these days? I guess it's pretty interesting to poke around for big, flashy totals -- and yeah, it would be cool to recognize the player with the highest number of 90s -- but I'm really more interested in how and why you pushed all those characters to the cap in the first place. Are you chasing the whole concept of one level-capped character of each race or class? Perhaps you've been building an empire of craftspeople. Or maybe you just really, really, really like the leveling game. What drives you to level 90 again and again? Are there any of you out there who've actually leveled an entire character select screen full of characters to level 90? If you have more than a handful of 90s, what's your motivation for level-capping so many characters? Who here has the most level 90s -- and why? originally appeared on WoW Insider on Thu, 21 Mar 2013 17:00:00 EST. Please see our terms for use of feeds. It's true that nearly every day we feature a machinima on WoW Moviewatch, but we here at WoW Insider occasionally feel compelled to pick favorites, or at least memorable ones. Today, I want to focus on some older gems that haven't had any time in the spotlight for a while and deserve some love. If you're new to the game these videos might provide you a glimpse into an inaccessible time now gone, and if you're new to machinima it might spark a desire to seek out more. Regardless, I've chosen a variety of films that hopefully showcase the enormous potential in using WoW's game engine to produce cinematic content, as well as the boundless creativity and talent within the WoW community. Read and watch on below the cut. Five World of Warcraft machinimas you need to know about originally appeared on WoW Insider on Thu, 21 Mar 2013 16:00:00 EST. Please see our terms for use of feeds. The second wing of Throne of Thunder Raid Finder was just unlocked this week, so get ready to queue. After our last 5-second guide to the first wing, we couldn't just leave you hanging without a second! After being thrown down to the Forgotten Depths, you'll be introduced to a few beastly bosses -- be prepared. Here's a quick rundown perfect for sharing with your Raid Finder comrades (thanks for the help Thugmuffins!). One tank on Tortos, the other on Vampiric Cave Bat duty. Don't stand in Rockfall. Healers be ready to top the raid after Quake Stomp. Kill priority is bats, Whirl Turtles, then boss. Be sure to kick one of the turtles into Tortos to interrupt his Furious Stone Breath. Although you can mostly survive the breath on Raid Finder difficulty, make your healer's life easier by interrupting. Note: You will have to kill the three Eternal Guardians around the cave and ring their bells to spawn the boss. Tank the two active heads facing away from the center, and don't tank the same head twice in a row to avoid debuffs stacking too high. The raid should stack in the center during Rampage for AoE heals. Kite the beam out of the raid if you're targeted with Torrent of Ice. Run out of the raid for a Cinders dispel. Run away from the Acid Rain. Kill order of the heads in this difficulty isn't too important, just rotate -- green, red, blue will work fine. See Ji-Kun's quick strategy after the break! Throne of Thunder: Forgotten Depths Raid Finder bosses in 5 seconds originally appeared on WoW Insider on Thu, 21 Mar 2013 15:00:00 EST. Please see our terms for use of feeds. Here at WoW Insider we're suckers for a sweet story. And this is definitely a sweet story, with a very Warcraft theme. The MK over at Khalanil wanted to make a warcraft-themed proposal, and so got to work, heading over to an unofficial WoW blog by the name of World of Warcraft Papercrafts. Amongst other things, Khalanil found an origami treasure chest, as pictured in the header image above. 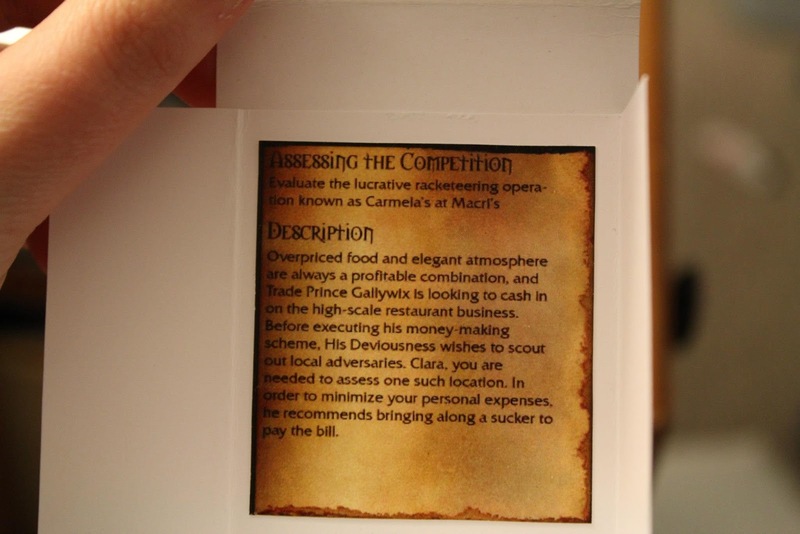 He also managed to lay his hands on some quest background images, the Morpheus font, and some other WoW assets, that enabled him to put together what must be the sweetest questline we've ever seen. 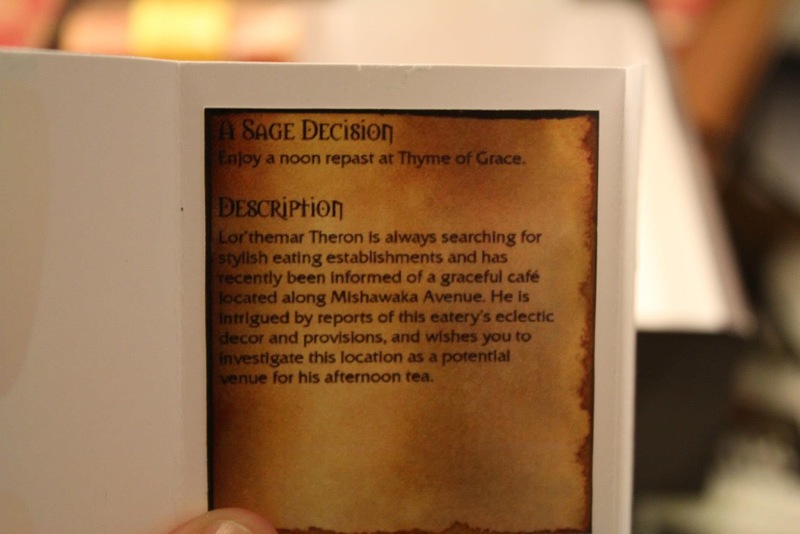 He created three quests, one to find an afternoon tea spot for Lor'themar Theron, the completion of which opened up a quest to eliminate dwarves at a local tea-room, and finally, Clara was sent out to scout a high-price eatery for Trade Prince Gallywix. 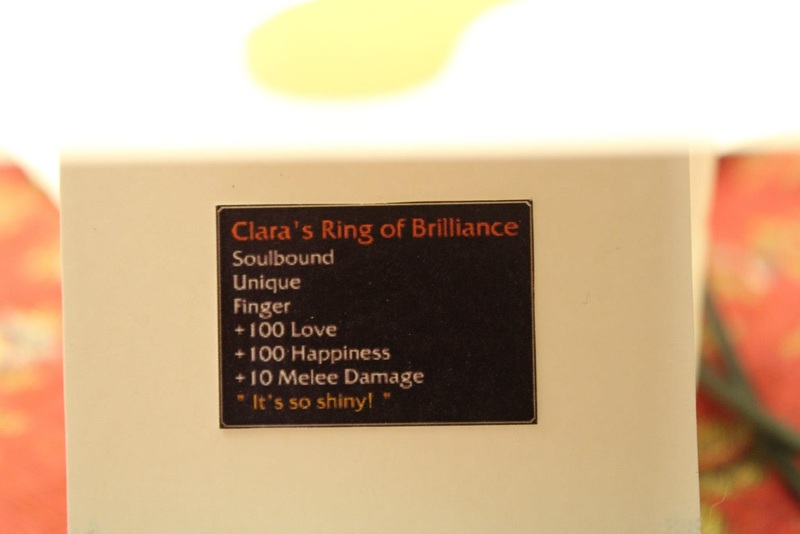 Completing the final quest granted Clara a Legendary item, which was concealed in the box we saw at the start. WoW Insider particularly enjoyed the stats on this item: +100 Love, +100 Happiness, and, just for good measure, +10 Melee Damage! You never know when you might need it. Do head over to Khalanil to read the full post! The quest of a lifetime originally appeared on WoW Insider on Thu, 21 Mar 2013 14:00:00 EST. Please see our terms for use of feeds. Hey baby, what are you doing this Friday night? Let's party at Club Trix in Gadgetzan (Wyrmrest Accord-RP-US). They've got a real DJ, a goblin named Trixxiz, and his crew spinning goblin-engineered techno on Radio Trix. 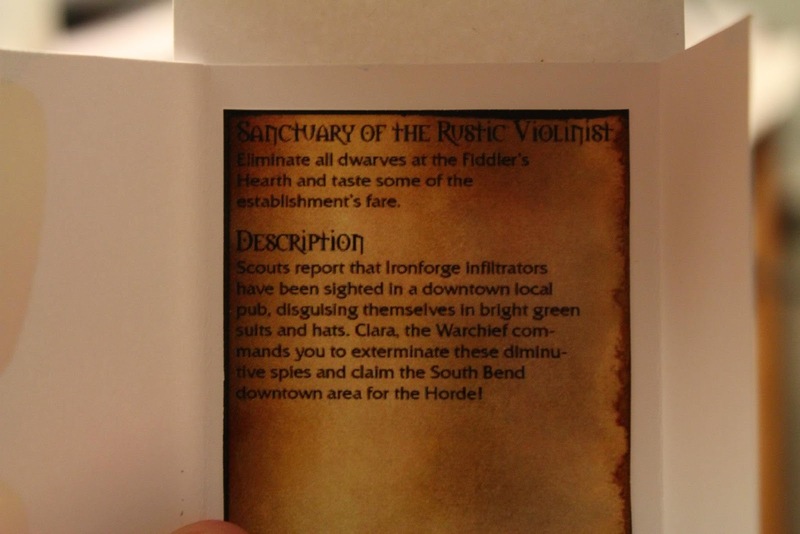 There's a featured drink menu (Hordeside, at least), regular special events, and a chill crowd enjoying the goblin groove. Originally from Bilgewater in Azshara, Club Trix has moved through Dalaran and now runs out of Gadgetzan, where the underground vibe is hot and there's plenty of room outside for enterprising goblins to get their profit on. WoW Insider interviewed DJ Trixxiz to find out more about the hottest new club on Azeroth's scene. WoW Insider: Trixxiz, you're a DJ out in the real world, aren't you? DJ Trixxiz: I am and have been a DJ since around 2004, I think. I had a few gigs over the years but not many, because within the already limited audience of electronic dance music, I was playing one of the lesser-popular genres of trance in an area dominated by house and techno. (I live halfway between Chicago and Detroit, the birthplaces of each, respectively.) However, the past couple years, trance has been exploding in popularity and I'm looking to break back into the scene this summer. Otherwise, I've mostly been an online presence throughout the years with shows on online radio stations, generally pulling in around 300 listeners, and several labels send me tracks to promote before they're released to the public. Even though I've got these other radio shows that pull in way more listeners, Club Trix is by far my favorite. With most internet radio shows -- even local radio antenna FM shows which I've also done in the past -- the amount of community feedback and interaction is very minimal. It airs, you hope that someone enjoyed it, and that's that. With Club Trix, there's this whole level of interaction with the listeners happening in real time through the IRC chat and the game, and they make it all come alive -- which makes it probably the most rewarding radio show on the internet save for a few run by the giants in the industry who can make that happen without the aid of roleplay environment. Players rave to underground goblin techno at Wyrmrest Accord's Club Trix originally appeared on WoW Insider on Thu, 21 Mar 2013 13:00:00 EST. Please see our terms for use of feeds. If you've been on the leveling treadmill -- or if you frequent the WoW forums -- chances are you've noticed that after patch 5.2, you stopped automatically discovering new flight paths. For those of you (myself included) who loved this feature, it's unfortunately an intentional change. According to everyone's favorite floating skull, Zarhym, the auto-discovery of flight paths -- introduced way back in patch 4.2 in June 2011 -- was never intentional. @autumnsunxo @bubblepuffle Unfortunately, you weren't provided correct info. Auto-discovery was never intended. Post to explain coming. So why's it waited so long? Again, according to Zarhym, it was a complicated problem to crack -- and low on the priority list. @reaper2352 Until 5.2 we couldn't fix it without erasing what paths any character had discovered pre-Cataclysm. It required new tech. While I mourn the loss of what was one of my favorite Cataclysm-era features -- the run through the Wetlands to pick up the flight path at Menethil Harbor used to be a killer, literally -- I can't complain too much. After all, with mounts starting at level 20, hearthstones on a 15 minute cooldown (with the right guild perks), and flight paths scattered conveniently around the world, getting around is easier than it's ever been, even without automatically discovering new flight paths. In patch 5.2, automatic flight path discovery is a thing of the past originally appeared on WoW Insider on Thu, 21 Mar 2013 12:00:00 EST. Please see our terms for use of feeds. That smell is Paris Hilton. The solo dungeon quest to open more of the island was a blast, do you think Blizz might give us more solo dungeon action. Maybe for a few valor or trans. gear items or something? The Queue: Damn, Zarhym smells good originally appeared on WoW Insider on Thu, 21 Mar 2013 11:00:00 EST. Please see our terms for use of feeds. After submitter Daenerys of Khaz Modan (US-H) lost her beloved husband-to-be in a tragic blimp accident over Loch Modan, she thought she would never see him again. But when Lorewalker Cho pulled up the images of the blood elf people during a quest in the Jade Forest, she was able to say a proper goodbye. At least until she looked slightly to her right and realized that he had spent the afterlife hooking up with her identical ghost-twin. One full-on Maury style slapfest, coming right up! Around Azeroth: Beyond the veil originally appeared on WoW Insider on Thu, 21 Mar 2013 10:00:00 EST. Please see our terms for use of feeds. With the awesome buffs to MM in Patch 5.2, MM hunter DPS is better than ever, just a theoretical wee bit behind SV DPS. Despite this, however, MM continues to be vastly under-represented in raid parses, often having so few it's impossible to make a statistical evaluation of their performance (and that's before even considering the selection bias). Theories abound for the lack of MM representation: MM is harder to play; MM is technically a bit behind the others so everyone leans on the ones ahead; MM has no clear role in which they are superior (unlike BM burst and SV AoE); MM is associated with elves, and no one wants to have anything to do with dirty elven things. It's been a long time since MM has been a popular spec, and most of the hunter optimization sites focus on maximizing your performance in BM or SV. So now seems like a good time to review how to optimize your MM hunter to take full advantage of all those juicy 5.2 buffs. Scattered Shots: How to play a MM hunter originally appeared on WoW Insider on Thu, 21 Mar 2013 09:00:00 EST. Please see our terms for use of feeds. Logging on to do my dailies last night, I was confronted by this dread error message. What horrible doom had befallen me? Oh, I'd forgotten to pick up a new game time card. While I'd previously given Blizzard my credit card information and let them bill me as needed, lately I've gone the game card route -- mostly because it was easy to pick up game time cards using gift cards after the holidays. But I have a feeling that laziness will win out moving forward and get me back on a credit card subscription plan. That way I can never forget and get this login error again... though on the flip side, it also means I could go weeks without playing and still pay for it. And what about you? How do you pay to play? Breakfast Topic: How do you pay to play? originally appeared on WoW Insider on Thu, 21 Mar 2013 08:00:00 EST. Please see our terms for use of feeds. In China, because of cultural rules/laws, dead players are represented by tombstones instead of skeletons. Dave Kosak tweeted as much and shared this picture with us all. And now you get to enjoy Oondasta stomping around a graveyard. You can see a larger version of it right over here. Oondasta in China is full of ... tombstones originally appeared on WoW Insider on Wed, 20 Mar 2013 21:21:00 EST. Please see our terms for use of feeds. I had a big post planned for this week about battleground attitudes, etiquette, tactics and other issues, but received an email from a twitter follower and changed my mind. That twitterer, Micke, wanted to get some tips and information on how to get started in arenas. And I think that's a great question. If someone has never done arenas before, it can be a daunting process to get started in what might seem like a rather strange and impenetrable world. Every week I see players asking in Trade for partners to cap conquest and lately I've started to ask myself if I should try that, or if it would just be a waste of mine and, more importantly, other people's time? Am I good and/or geared enough to try? Maybe you could help me with some answers. First of all, 2s, 3s or 5s? Which would you say is most forgiving for noobs? Secondly, what's a reasonable gear point to keep me from being totally useless? How to get started in arenas originally appeared on WoW Insider on Wed, 20 Mar 2013 20:00:00 EST. Please see our terms for use of feeds. Last week I covered the basic idea behind PvE twinking, what it is, why someone might be interested in it, as well as the early levels and zones available for a new, leisurely-leveling toon. Let's say you've exhausted every quest there is to click, farmed every instance the dungeon finder will let you get your hands on, and are finding yourself corpse running more often than tolerable; well, now's the time to move ever forward. Level 35 and upward is the time when you'll begin to encounter more neutral quests. That's not to say you won't ever see differences between Alliance and Horde, but it is true that a number of story lines begin to converge and overlap at this point in the game. This is also the point when you can expect to gain a lot of freedom as a player, as well as when you can very reasonably be expected to get overwhelmed by options. I'm going to do my best to point out specific places and quest chains you shouldn't miss, but I'm sure I'll forget some anyway, so feel free to add your own suggestions in the comments. The fine art of PvE twinking from level 35-60 originally appeared on WoW Insider on Wed, 20 Mar 2013 19:00:00 EST. Please see our terms for use of feeds. Wowcrendor is known for his funny videos, which we regularly feature on Moviewatch, and this is definitely no departure from his usual comedic form! Wowcrendor takes a step away from Billy and his usual antics to take a look at the unappreciated, the unloved, the uninterested. The NPC. The guards who nobody really pays attention to, despite their years of service. The identical orc triplets, the lonely gnomes with dubious fashion tastes, and my personal favorite, the Ramkahen guards and their over-eager swaying. I know that the best videos leave their watchers wanting more, and I definitely want to see another of these detailing the trials and tribulations of life as an NPC. What do you think they're thinking? WoW Moviewatch: What are NPCs thinking? originally appeared on WoW Insider on Wed, 20 Mar 2013 18:00:00 EST. Please see our terms for use of feeds. Chain pulling is one of those divisive things. It's a really fun way to put some excitement into tanking in content you know very well, to push yourself a bit harder, as well as being fairly key to taking on challenge modes. It's also something which, when done right, can earn you the respect of your peers in the few five-mans we're actually getting in this expansion. It's also, of course, the fastest way to get to that juicy valor reward at the end of the rainbow. However, it's also a very easy way to annoy people, particularly your healer, if it's not done right. So, in order to maintain the sanity of your group-mates, let's get started with WoW Insiders five tips to stop you chain pulling like a bit of a pillock. Communication is the key to not pulling like a prat, and while you may be in full raiding epics, your healer might have snuck over the item level requirement with a bag full of BoAs, while wearing questing greens. Or they might have never healed on this character before, or never healed before, or never been in that dungeon before, or never been in a WoW dungeon before. Random matching means you don't know what your team-mates are capable of, and yes, you can inspect them and make assumptions, or you can ask. But an essay is not really needed. Just say that you're going to go fast, and that if it's too much, they should say so. A whisper is probably the best way to do this. Chain Pulling 101: Five tips to prevent you from pulling like a pillock originally appeared on WoW Insider on Wed, 20 Mar 2013 17:00:00 EST. Please see our terms for use of feeds. I'm taking a trip back into the past this week. I was discussing the history of the game with a friend and we got to talking about Blackrock Depths, about how the instance felt like an ancient city in many respects. Some of them were good, and some of them were bad. And then we got to discussing the Onyxia attunement chain. We realized that for many players, this quest and the lore behind it was completely lost. Even the main players were no longer to be found. So I've decided to take this week and talk about Marshal Reginald Windsor, who so bravely (and nearly nakedly) hurled himself into trash packs with the fervor and intensity of a raging lion. A raging lion who would aggro every trash pack well before you were ready for them, and get his crazy behind stabbed to death if you didn't get over there and pull them off of him, only to do it again immediately after. A brave, bold, absolutely fearless man who made that quest sheer torture until you outgeared the heck out of it. I admit, it was actually kind of fun to come back in BWL/AQ gear and stomp a new mudhole in some Dark Irons. So who was this brave and dangerous knight? Who was Marshal Reginald Windsor, and how did he end the Great Masquerade and save Stormwind from the Black Dragonflight's wicked broodmother herself? Know Your Lore: Marshal Reginald Windsor and the Great Masquerade originally appeared on WoW Insider on Wed, 20 Mar 2013 16:00:00 EST. Please see our terms for use of feeds. If you're a pet battler, Wowhead is a popular stop for solutions to head-scratching trainers or mysterious wild pets. There are so many collectable battle pets that it can get a bit hairy to memorize every ability or plan out a team before leveling a new battle pet. Wowhead has just released new and updated battle pet tools to make the journey to master tamer a smooth one. Being an avid pet battler, I'm very excited to see these additions. It hasn't been easy to track battle pet breeds and other information outside of addons in-game. So, being able to look everything up at once over at Wowhead will be a time-saver. The Battle Pet Calculator displays health, power, and speed based on the battle pet's breed, quality, and level with an easy-to-use slider. An enhanced Battle Pet Listview now makes it easy to see a breakdown of a level 25 battle pet's stats, abilities, as well as other key pieces of data. The Pet Abilities filter is similar to Wowhead's current Spells filter, and allows users to filter by mechanics -- like Block or Burn -- buffs, debuffs, battle pet family, and more. There's more to see, so head over and take a look at the new tools. Wowhead releases new battle pet tools originally appeared on WoW Insider on Wed, 20 Mar 2013 15:00:00 EST. Please see our terms for use of feeds. Joining a guild has always been a core aspect of World of Warcraft. How to choose the right style of guild can be an especially large hurdle to overcome for new players, but it's something we learn along the way. Players currently have a few resources at their disposal, whether it be the Blizzard Guild Recruitment forums, GuildOx, WoWProgress, or other tools. But there's an oft-forgotten in-game tool that was released back in patch 4.1. What about the in-game Guild Finder? The options are a bit limited, and the listings depend on the effort put in by guild masters. Let's just say it's a neglected feature on a few fronts. I've used the Guild Finder before, when searching for a casual leveling guild on a new server. Outside of that, I stick to other tools when recruiting or looking for a new guild. What about you -- do you ever use the in-game Guild Finder? What's your preferred resource for guild recruitment and discovery? Poll: Do you use the in-game Guild Finder? originally appeared on WoW Insider on Wed, 20 Mar 2013 14:00:00 EST. Please see our terms for use of feeds. Every week (sort of), WoW Insider brings you Shifting Perspectives for cat, bear, restoration and balance druids. This Tuesday, the bookmarks folder gets the root cellar treatment. I've been away from the game since the holidays due to what I will politely refer to as technical difficulties. (I have a variety of impolite terms for it too, but this is a family blog.) During that time, I've watched the game from the sidelines and have grown bored enough to do some maintenance on stuff that usually gets ignored until I'm rooting through it in a hurry. Add-ons were updated, dead blog links were sent to their folder, interesting ones were added, and then I turned to my collection of bookmarks in order to prune there as well. I have a pretty sizable cache of druid or druid-related links that's grown over the years, and a lot of them are still pretty interesting. In the absence of the ability to talk about what's actually happening in the game with any fluency, I thought it might make a decent stopgap Shifting. This is a selection that's kept me absorbed for many an hour on a snowy weekend, and it ranges from comparisons between druid and warrior tanks in the classic game to where you fall on a healer's priority list when you're a jackass. Shifting Perspectives: Spring cleaning originally appeared on WoW Insider on Wed, 20 Mar 2013 13:00:00 EST. Please see our terms for use of feeds. There used to be a saying amongst healers: "It costs less mana to rez a rogue than to heal one." Rogues were the only non-plate melee class (shaman and druids were healers), and our leather armor didn't absorb heavy blows. I remember gearing my first rogue specifically for stamina and fire resistance. I wouldn't be invited to the raid unless I could meet the 4,000 HP minimum health requirement. If I accidentally stole aggro, I would be squashed like a grape. Times have changed. Rogues are now the most durable melee class, and it's not even close. Enhancement shamans and fury warriors can't toss on a shield without severing all hope of dealing competitive DPS. Rogues are capable of dealing nearly their maximum damage while taking less damage than any other class in the raid. Encrypted Text: The incredible, indestructible rogue originally appeared on WoW Insider on Wed, 20 Mar 2013 12:00:00 EST. Please see our terms for use of feeds.